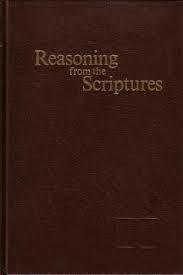 The reasoning book was one of the best tools I used when I was a Jehovahs Witness. The idea behind this book was how to deal with certain subjects (such as the trinity, the cross, birthdays etc) when they came up on the ministry. The truth is that this means you never have to look at why Christians believe in the Trinity or take any of their literature, you just have to look into this book as to how to respond to the Trinity. Instead of providing a broad, general coverage of each subject, Reasoning From the Scriptures focuses primary attention on questions that are currently being asked by many people. To a Jehovahs Witness this is a vital book to help aid there preaching work. There will be a view issues that they talk about in this book that actually as a Christian I would share in terms of their view. You can view the whole book from their new online Watchtower library. As you will see there are some things we would agree on (no abortion, creation, not worshiping images). However there a number of different issues that you will need to face as a Christian, that present themselves in this book. I will not be covering a specific article that is found in this publication as this is just an introduction. Definition: The belief that faithful Christians will be bodily caught up from the earth, suddenly taken out of the world, to be united with the Lord “in the air.” The word “rapture” is understood by some persons, but not by all, to be the meaning of1 Thessalonians 4:17. The word “rapture” does not occur in the inspired Scriptures. Gods spirit guided organisation, 1000 year reign, blood transfusions forbidden, Theocratic arrangement, only 144,000 bound for heaven, 1914 would mark the return for Jesus. This idea then on the grounds the word or expression is not directly printed in the bible is one then that does not really work, however it is one they like to use. It is unlikely they will ever give this book to you, but they may well take it out while on the door to you. “this book makes limited use of quotations from secular history, encyclopedias, religious reference books, and Bible-language lexicons. Thus, instead of making assertions as to the origin of false religious practices, the development of certain doctrines, and the meanings of Hebrew and Greek terms, the book shows the reasons for statements made. However, it directs attention to the Bible as the basic source of truth”. If that sounds a bit suspect that’s because it is! I would strongly suggest that if Watchtower literature ever quote any other publication that you check it for yourself that they have not try to twist the quote to support their own doctrine. For example on page 405 where they are trying to explain how the trinity is un-biblical, and they quote the The New Encyclopædia Britannica. “Neither the word Trinity, nor the explicit doctrine as such, appears in the New Testament, nor did Jesus and his followers intend to contradict the Shema in the Old Testament: ‘Hear, O Israel: The Lord our God is one Lord’ . I suggest that you get hold of the New Enclopaedia Britannica and check out this quote. While the Britannica does say this it also goes on to say “The earliest Christians, however, had to cope with the implications of the coming of Jesus Christ and of the presumed presence and power of God among them—i.e., the Holy Spirit, whose coming was connected with the celebration of the Pentecost. The Father, Son, and Holy Spirit were associated in such New Testament passages as the Great Commission: “Go therefore and make disciples of all nations, baptizing them in the name of the Father and of the Son and of the Holy Spirit” (Matthew 28:19); and in the apostolic benediction: “The grace of the Lord Jesus Christ and the love of God and the fellowship of the Holy Spirit be with you all” (2 Corinthians 13:14). Thus, the New Testament established the basis for the doctrine of the Trinity”. So the Britannica actually says that the trinity IS based on the New Testament. The reason for the word “trinity” was to help people grasp that God is Father, Son & Holy Spirit. This was valuable because during the first century there was many false religions that where trying to claim that Jesus was not the Lord. It was not necessary to put the word “trinity” in the new testament people new Jesus was “God with us” (Matthew 1:23) they were waiting for the Messiah, not the arch angel Michael. It therefore is worth in this book checking the references to see what the quote actually says in the context. What is good though that in this book on page 7 says “Keep in mind that this book is only an aid. The Bible is the authority. That is God’s Word”. Although they may claim this, ultimately to a Jehovahs Witness the Watchtower literature is also Gods authority. However it may be good to use this quote while discussing doctrine. John 14:25 – However, the helper, the Holy Spirit, whom the Father will send in my name, will teach you everything. He will remind you of everything that I have ever told you. There is a lot in this book about overcoming conversation stoppers, how to respond, even the exact words to say……but no mentioning of asking God to help. I therefore word always advise as a Christian, when you know a Jehovahs Witness is coming to your door you pray prior to it opening and let God use you to say what needs to be said. It may well be that these reviews of there “reasoning book” will help, but ultimately God will do what needs to be done. 1 Corinthians 3:6 – I planted, Apollos watered, but God gave the growth.